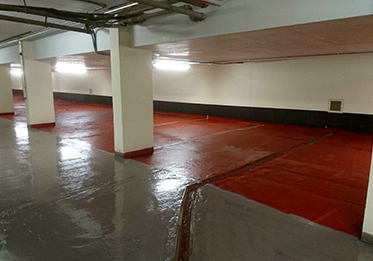 Triton Systems supplied waterproofing systems specified by waterproofing design specialists, Ink Technical Services, for the upgrade to a below ground car park in North London. BS 8102 (2009) recommends the involvement of a waterproofing specialist at the design stage of any waterproofing project. Involving an expert at this stage also minimises the risk of system failure in the future. INK’s initial inspection revealed a reinforced concrete construction with a surface water drainage system in a poor state of repair. There was water seepage from cracks in the floor and from the wall/floor joints. Much of the floor was badly stained with oil. Taking into account the intended use of the area as a car park below a residential block, and an unknown water table classification, INK recommended a ‘Type C’ drained waterproofing system (as defined in BS 8102: 2009) for the perimeter walls and a ‘Type A’ barrier protection system to the floors. The Type C system would comprise a new concrete upstand to maintain the structural integrity at the perimeter wall/floor junction and to provide the required perimeter drainage channel detail. The recommendation included the waterproofing of the upstand using shrink compensated mortar at internal and external floor angles and a cementitious ‘tanking’ slurry. The INK design also stipulated that rodding points were incorporated to the drainage channel and the system tested prior to installation of the membranes. The wall/soffit angles at the perimeter of the basement should also be waterproofed with shrink compensated mortar and a one metre band of tanking slurry installed around the perimeter of the soffit to which the top of the 8mm studded cavity drain membrane could be sealed using a special membrane sealing strip. To minimise damage to the walls by cars INK also advised the installation of a suitable concrete block wall, tied back to the external wall using special membrane ties. The design also recommended an additional 300mm ‘condensation’ strip of the 8mm membrane to be installed to the base of the block wall facing the membrane, to minimise the risk of condensation in the cavity. It also included the installation of vent grills in the block wall to give access to the rodding eyes of the perimeter drainage channel. INK also recommended the existing sump and pumps were fully serviced as part of the upgrade and a mains/battery high level alarm incorporated as a minimum requirement. Ideally this would be a telemetric system enabling remote alert to any potential issues. A 12 monthly service schedule will also be put in place to maintain the pumps and drainage system to be carried out by the installing contractor or suitable specialist. The recommended two-component epoxy coating for the floor would provide Type A waterproofing, with the second coat incorporating an anti-slip grit. Prior to the coating being applied, the floor was to be cleaned and all cracks repaired with a suitable waterproofing plugging compound. The INK team was satisfied that providing the above design was installed by a specialist contractor, a Grade 2 environment would be achieved for the residents. This ‘level of dryness’, according to the British Standard, is one that tolerates moisture vapour but no water penetration and is the typical Grade required for car parks and retail storage areas.